I’m not usually a fan of salads. I normally prefer something warm or carb-y for lunch but this salad is an exception. 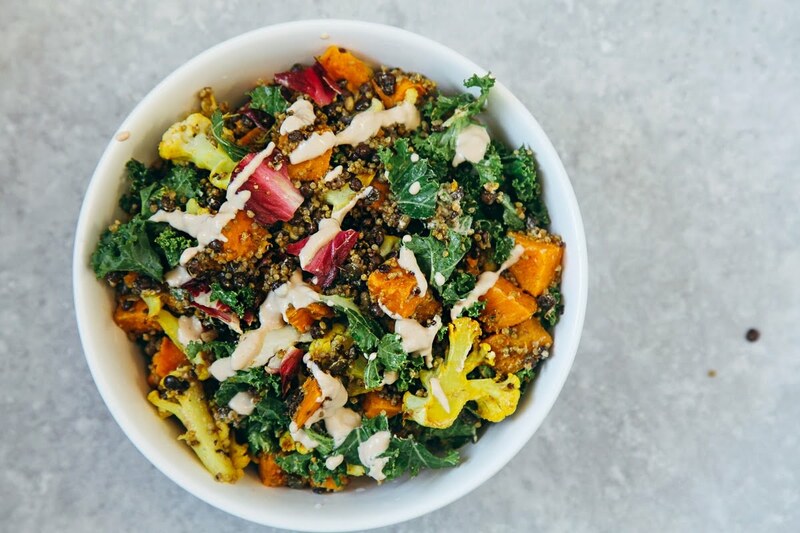 Flavourful squash (or sweet potato) and cauliflower, roasted with cumin and turmeric, mixed with quinoa, puy lentils, seeds, kale and radicchio (or red cabbage) – all mixed together in the most creamy, delicious tahini & garlic dressing. PURE HEAVEN. Plus, t’s really healthy and packs a lot of plant-based protein too, making it a great post-workout meal or just a really nutritious and satisfying lunch. The recipe below makes up a BIG bowl, giving you 4 large or 6 medium servings. So feel free to halve the recipe if you want something a bit smaller. You can keep it in a container in the fridge for up to 3 days – it might be best to keep the dressing separate, if you do this. Although, I’ve had no problems eating the leftovers mixed in dressing days later. This salad does involve a bit of cooking but I promise it’s worth it for the taste and convenience of having 3 days of lunches sorted. Plus, if you want to use a shortcut, you can now buy cooked quinoa or lentils in packets at the supermarket which you can add straight into the salad. *Or to cook from scratch, use 1/2 cup dry lentils + 1/2 cup dry quinoa and cook according to packet's instructions. Just made this salad and it turned out very goid. Thank you for the recipe. Quinoa is my favorite. I always try this with shredded chicken and prawns. Today i tried this recipe and it was awesome!! Yum, this looks so delicious, I will no doubt be making this very soon!